CHICAGO--(BUSINESS WIRE)-- Community leaders, project partners and local residents today celebrated the grand opening for Myers Place, a new $13.2 million mixed-use supportive housing development located in the northwest suburbs of Chicago. Community leaders, project partners and local residents celebrate the grand opening for Myers Place, a new $13.2 million mixed-use supportive housing development located in Mount Prospect. Left to right: Larry Pusateri, principal, DDG; Rich Monocchio, Executive Director, Housing Authority of Cook County; Mitch Bruski, CEO, Kenneth Young Center; Cullen Davis, principal, DDG; Jessica Berzac, vice president for Development DDG; Mount Prospect Mayor Arlene Juracek; State Representative David Harris; Colleen Van Ham, CEO, UnitedHealthcare of Illinois; Aron Weisner, Senior Director, Enterprise Community Investment; Mary Kenney, Executive Director, Illinois Housing Development Authority; State Senator Julie Morrison; State Representative Elaine Nekritz; and former Mt. Prospect Mayor Irvana Wilks (Photo: Rod Pickett). Myers Place, located in Mount Prospect, fills a vital need for supportive housing in the region, providing affordable housing for people who are disabled, mentally ill or formerly homeless and who have the ability to live independently. It's the first-of-its-kind development in the region, featuring 21 one-bedroom and 18 studio furnished apartments, a state-funded supportive-services program for residents and 3,560 square feet of commercial space. The property also includes a community room with kitchen, laundry facilities and offices for case managers. Residents began moving into Myers Place June 1. They were selected from a waiting list of more than 300 applicants, highlighting the demand for this type of community development in the region. The project was developed by Daveri Development Group, a Chicago-based company that revitalizes and creates affordable housing communities throughout the Midwest. Kenneth Young Center, a Chicago-area provider of social services, is the not-for-profit joint owner, providing onsite case management, counseling and coordination with health care providers. "Myers Place serves a vital need in this northwest suburb of Chicago because it will begin providing affordable housing for people with some of the greatest needs in our community," said Jessica Berzac, vice president of Development at Daveri Development Group. "The large number of applications highlights how important of a milestone this is. We are so grateful for the support from our partners and the community for helping make today's grand opening a reality." "This supportive-housing development is unique to the area, providing residents the ability to live independently, yet have supportive services available to assist with some of their special needs," said Mitch Bruski, CEO of Kenneth Young Center. "Myers Place is an important addition to the region and a model for supportive affordable housing and community development for the future." Myers Place was unanimously approved by Mount Prospect Village officials in November 2011 and received a great deal of backing from many community organizations and partners that were integral to the project development. The Illinois Housing Development Authority (IHDA) allocated the critical use of federal tax credits that generated nearly $10 million in private equity and $2 million in Community Development Block Grant financing in partnership with the Illinois Department of Commerce and Economic Opportunity (DCEO). IHDA has been instrumental in supporting affordable-housing projects that provide independent living for people living with disabilities or who have been homeless. "Myers Place furthers Gov. Quinn's commitment to increasing safe, decent and affordable housing opportunities so more people with disabilities can live independently in a community setting," said Mary R. Kenney, IHDA executive director. "This project demonstrates how we work together with our private partners to create housing that will enable people with special needs to lead more active, dynamic lives." UnitedHealthcare of Illinois provided $8.1 million in Low Income Housing Tax Credit (LIHTC) equity to help build Myers Place through a partnership with Enterprise Community Investment, Inc. (Enterprise), a national leader in the affordable-housing and community-development industry, which provided an additional $1.7 million in LIHTC equity for the project. "Myers Place will create new opportunities, hope and a foundation of support for the people who will make this their home," said Colleen Van Ham, president and CEO of UnitedHealthcare of Illinois, which provides health care benefits and services to more than 1.1 million Illinois residents. "UnitedHealthcare is grateful to be one of the many community partners and to lend our support to such an important endeavor." Aron Weisner, senior director at Enterprise added, "Enterprise is proud to join with UnitedHealthcare to provide equity for Myers Place through the Housing Credit program, which is the main tool for investing in affordable housing nationwide. We wish Myers Place residents many years of happiness in their new home." Additional funding and community partners included Village Bank & Trust, which provided construction phase financing and $1 million in permanent financing, the Department of Commerce & Economic Opportunity ($100,000), the Corporation for Supportive Housing (CSH), the Housing Authority of the County of Cook, the Regional Housing Initiative and The Task Force -- North/Northwest Suburban Supportive Housing for Individuals with Mental Illness. The grand opening, attended by project partners and community leaders, featured a formal ribbon-cutting ceremony, followed by a community open house and tours of the facility. Mount Prospect Mayor Arlene Juracek, State Senator Julie Morrison, State Representatives David Harris and Elaine Nekritz, Cook County Commissioners Tim Schneider and Elizabeth Gorman, IHDA Executive Director Kenney and Hugh Brady of National Association of Mental Illness (NAMI) Illinois were among the many dignitaries who attended. They spoke about the importance of the project and the opportunities it is creating for its residents, Mount Prospect and the surrounding community. "Myers Place has been a dream envisioned by so many in our community for many years, and we are fortunate that it was the right project for the right place in Mount Prospect," said Mayor Juracek. 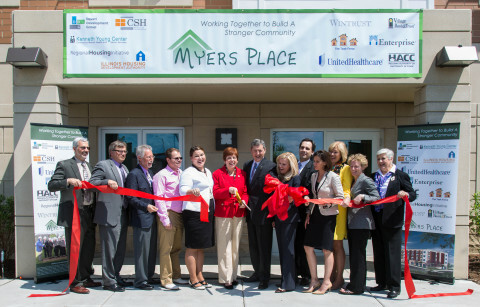 "The housing needs and services that Myers Place provides are critical to our special-needs population, and we appreciate all the community partners for being there every step of the way to celebrate this milestone." The article Mount Prospect Community and Project Partners Celebrate Grand Opening of Myers Place - a First-of-Its-Kind Supportive-Housing Development in Northwest Suburban Chicago originally appeared on Fool.com.